Our large 12" Straight Bully Sticks are ideal for big dogs or little dogs with big appetites for chewing. Made exclusively of all natural ingredients, our 100 percent natural beef bully sticks are free of any fake ingredients. That means no artificial chemicals, additives, hormones or scary-sounding preservatives--the only thing your dog will taste is all natural beef sourced exclusively from the tastiest beef on the market. Shop in bulk and score big savings on our famous bully sticks today! We know how much dogs love to chew. From phones to textbooks and everything in between, it seems like there's nothing pups won't eat up. That's why we've created the perfect product to satisfy your dog's appetite to chew. Here's a fun fact for you: chewing is actually good for your dog. OK, so maybe chewing on random things like chapstick and TV remotes isn't ideal, but chewing in general is a natural instinct that helps to relieve boredom and stress. Our bully sticks are long lasting, delicious dog treats that will keep your pup occupied for hours or days on end, depending on how much your pup likes to chew. Plus, our bully sticks are great for combating tartar and plaque buildup. It may seem weird that beef actually improves doggie dental health, but it's true--by chewing on that tasty bully stick, your dog is blissfully unaware that she's naturally cleaning his teeth and gums. That beats having to go to the doggy dentist all the time! An added bonus? We do everything we can to make our bully sticks for dogs as odor free as possible by sourcing them from the highest quality ingredients, thoroughly cleaning them and removing their moisture content. Our goal is to make sure your dog receives the best-tasting and healthiest treat as possible without the use of harsh chemicals. We'll be the first to brag about how delicious our bully sticks for dogs are. Since we know how much dogs love the taste of beef, we preserve as much of that natural flavor as possible by carefully roasting our dog chews in the oven. Once they're done baking, our bully sticks are ready to be devoured by your furry friend. If your pup really loves the taste of our large bully sticks, feel free to stock up and save for any occasion. With a long shelf life of 36 months and a variety of bulk buying options available, you can think of stocking up on bully sticks as a sort of investment fund for your pooch. Ensure your dog is never without her favorite chew--shop our bully sticks to discover why Pawstruck has the best natural dog treats money can buy! A. You heard correctly! 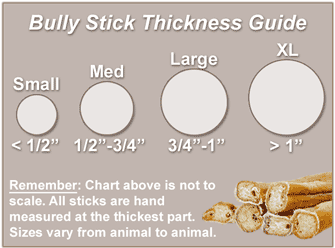 Large quantities of our 12" Bully Sticks are available for a discount--in fact, you can save up to 15% on your order! We also offer an Auto Delivery feature that certainly comes in handy--simply tell us how often you'd like us to deliver your supply of yummy bully sticks and we'll be sure to get 'em to you on time. 12" x 0.875" x 0.875"